The transition to summer is in full swing and peaches couldn’t be more plentiful, juicy and fragrant. They are in such great abundance at every market, so let’s make the best of the moment while we have these gorgeous gems in our sights. Nothing says summer like shortcake! And since peaches and cornmeal are such a natural pairing, I couldn’t resist adding a bit of cornmeal to the traditional shortcake dessert. These are spectacular: light, tender, slightly sweet with just enough cornmeal to create a slight crunch and really wonderful flavor. The cream adds the requisite indulgent lusciousness and the peaches bring that fresh spark of natural seasonal beauty and color, reminding us so profoundly how very fortunate we are to be in the company of Mother Nature. - Make sure the butter and buttermilk are cold. When blending with the flour mixture, work quickly so they don’t warm up. - Take care not to overmix the shortcake dough to keep the final product light and delicate. Be gentle to avoid toughening, treating the dough much like you would a scone. They bake quickly, so check them at 10 minutes. 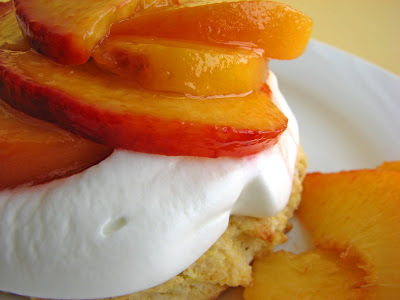 - This is the kind of dessert that is perfect for a trip to the farmer’s market to find the best peaches of the season. Give them a taste to determine how much sugar they’ll need. 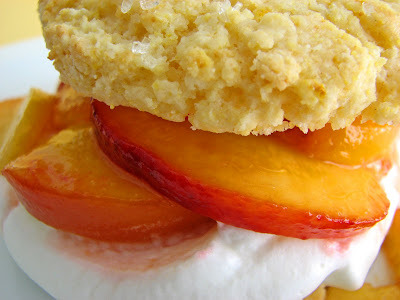 - This shortcake would also be fantastic with apricots, blackberries, raspberries and cherries. It's also really delicious to use a light caramel syrup with the peaches or add a bit of mascarpone or crème fraîche to the whipped cream. Preheat the oven to 425°. Prepare a baking sheet with a silpat or parchment. Whisk together the flour, cornmeal, baking powder, salt, sugar and citrus zest in a bowl. Add the butter and use a pastry blender or your fingers to blend until the mixture looks like coarse meal. Work quickly so the butter stays firm. Add the buttermilk all at once and stir gently with a fork just until it starts to come together. Do not overmix. Gather the dough and place it on a clean work surface or a piece of parchment and gently pat it together with your hands. Shape it into an 8” round and either cut into 6 wedges or use a round cutter. Place the shortcakes on the baking sheet. Brush them with some cream or milk and sprinkle the tops generously with coarse sugar. Bake about 10 - 13 minutes, until the shortcakes are lightly golden. For the peaches, gently blanch for just a few seconds in simmering water. You should see some give when you tug at the skins. Remove immediately to a bowl of cold water. Dry the peaches and peel off the skins. Slice and place in a bowl. Sprinkle with a splash of lemon juice and toss with the sugar. Let the peaches sit for about 15 minutes to bring out the juices, gently tossing once or twice. Whip the cream, sugar and vanilla to a very soft peak. Cut the shortcakes in half horizontally. Place the bottom halves on 6 plates. Dollop with whipped cream and layer some juicy peaches. Top with remaining shortcake half. I was wondering if you would like to exchange links. I'll drop yours on my food blog and you drop mine on yours. Email at ramendays@yahoo.com or stop by my site and drop a comment. Let me know if you would like to do a link exchange. MMMMMM..I would totally dig in,....YUmmie! My in-laws would love this. Cornmeal shortcakes are a great idea and especially with peaches. 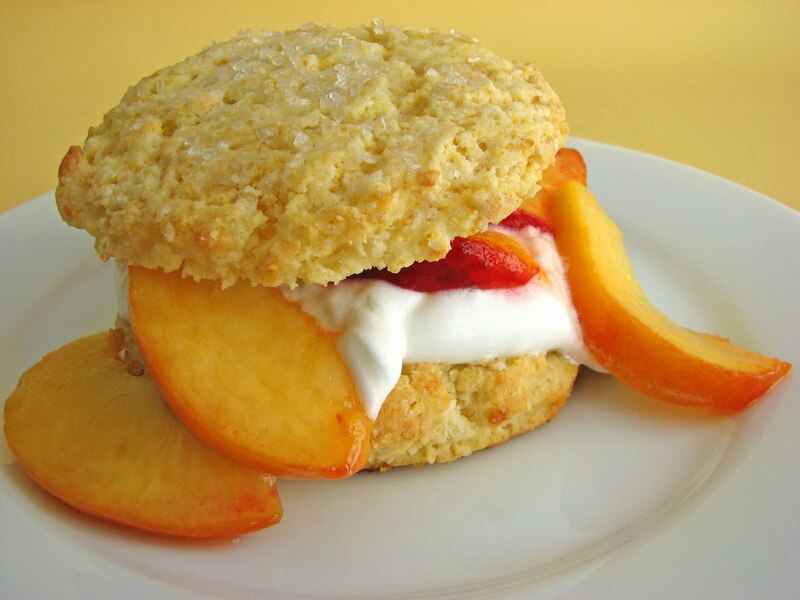 I wouldn't have thought to put cornmeal in a shortcake but it sounds genius! I can't wait to try this. These look wonderful! 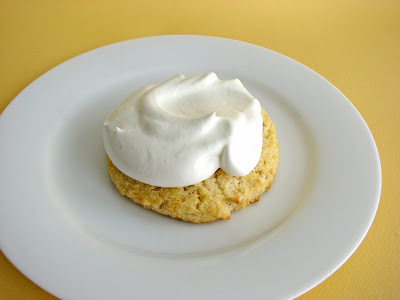 I have found regular flour shortcake to taste a bit heavy so far - I am dying to try your recipe; it looks so light. shortcake is definitely one of my favorite summer desserts. the peaches looks sooo juicy! That looks sooo good. I've just been eating peaches straight up because they're just so good on their own but this is very tempting. I am bookmarking this! It sounds like a really perfect summer dessert! What a tasty way to use peaches! Your picture is fantastic! It makes me want to run to the nearest market to buy peaches! Using cornmeal is an intriguing twist on shortcake...I am going to try this! great twist on shortcake. looks lovely. Found you by doing a search for cornmeal shortcake. Made these today but used blueberries and they were great- thank you! Run Lori Run, thank you very much for the positive feedback and I LOVE your idea for serving these with blueberries! !